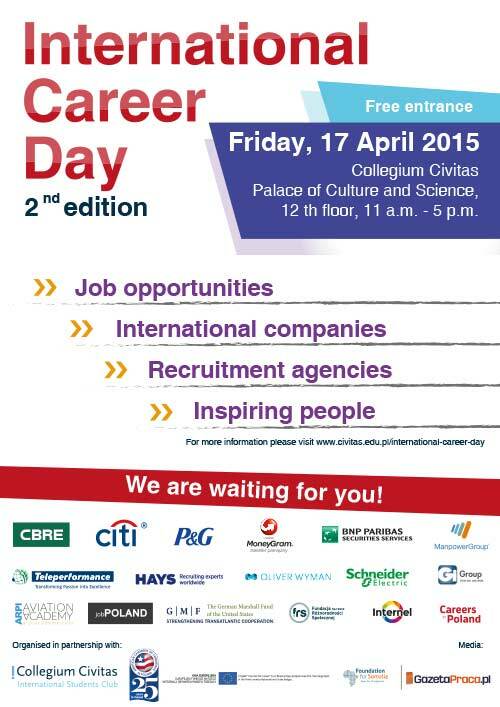 On April 17 in Warsaw the International Career Day 2015 will take place. Among organizers are: International Students Club Collegium Civitas, Foundation for Somalia and American Chamber of Commerce. Representatives of international concerns will be looking for some new true talents! Check the event webpage, too! CD’s previous edition was a great success. Just like last year, the team of Foundation for Somalia prepares advisory room for attendees, where our consultants will assist in the preparation of CV and covering letter. You will also find all the information about our projects, including internships, vocational courses and learning Polish language. Are you a foreign student and do not know if you can legally work in Poland? Or maybe your employer wants you to set up your own business activity? Learn all about the rules in the labor market so you will not get in trouble. During the meeting, you will gain knowledge about the different types of contracts and employee benefits. Sign up today for a workshop with labor law. 2. Prepare yourself for success and achieve it! Discover your potential! During this workshop we will show you how to open your mind and explore the deep hidden opportunities that you do not realize! Do not be afraid of success. Learn how to build a positive and affirmative attitude to life. We can help you determine clear goals and find inner peace and passion. With us you will succeed. Sign up for a workshop today. Welcome! 3. Before you enter the lion’s den, or how to do well on job interview. During the meeting, you will learn how to effectively prepare for an interview. An experienced trainer will tell you how to answer the recruitment questions to please recruiters. The most important part of the meeting will, however, be simulations of real interviews and obtain feedback on atendee’s skills. After the workshop you will have the necessary competences needed during a job interview. The participants of International Career Day 2015 will be able to take part in photo session and take a picture to CV. Anybody intrested will stand in front of the camera of Olena Herasym, the friend of Foundation for Somalia. Olena comes from Ukraine and is a professional photographer since 2011. You can admire Olena’s photos on her website Olena Herasym Photo. See you at the 12th floor of the Palace of Culture and Sciences!